At Velocity, no matter what the occasion is or what celebrations call for, everything is done in Unity. On the occasion of the 70th Independence Day of the free India, the organization went ahead and celebrated the festival with full zest and enthusiasm. Celebrated on the 14th of August, all the Velocitians were given a dress code “ethnic” and they were free to wear whatever they wanted with a color from the “Tiranga” or the Indian Flag. 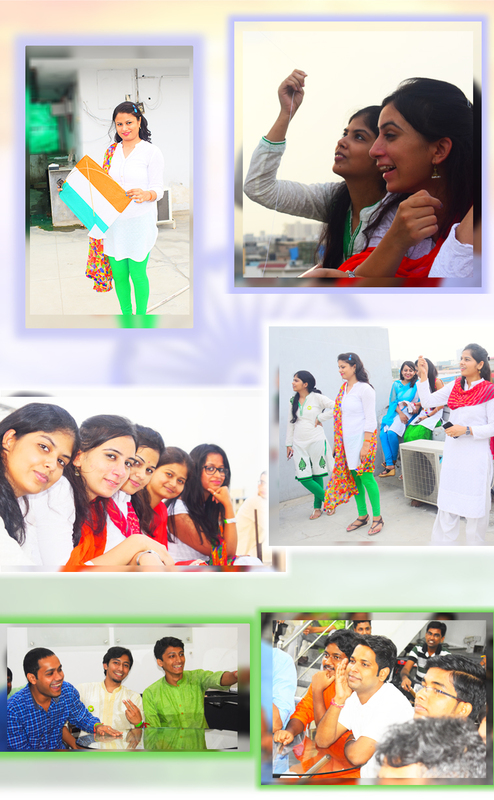 The day came and all the employees were donning beautiful colors from the national flag. As a custom of Velocity, the day started with a series of photo session where all the ladies made sure that they did everything to make memories. While everyone was free to do what they were doing, the Velocitians gave priority to work and spent some time completing their tasks. Until lunch, the office environment was both calm and peppy with people complimenting each other on their outfit choices, it was then when the fun actually started. The lunch was served by the organization and the lip-smacking “Indian Thali” included a number of choices of food. To name some, there was puri, sabzi, raita, vegetable biryani, salad and an all time favorite laddoos as the dessert. Once the lunch was done, the set up was done for the quiz. The HR Ambuja Trivedi became the quiz master and then started the rain of questions. Team after team, the questions were popped and one could hear the cheer and laughter quite loud. Everyone was enjoying for sure even when their marks were being deducted for out-of-turn-answering, but that didn’t stop the participants and even the audience to calm down. Quiz came to an end and the prizes were distributed to the teams. Then came the time when individuals could give their performance on the stage with patriotic songs, Shayari, poetries, jokes and more. The audience enjoyed every single burlesque and applauded for the same building up their motivation and that’s where everyone got to see the spirit of Indian diversity. The day to came to an end with happy hearts and cheerful faces who went back with the feeling of being free in their country.